Handcrafted with a modern twist on the classic principles of Mission Style Furniture, our Amish Made Bordeaux High Dresser is a versatile piece that will accentuate any bedroom decor! With eight, full-extension drawers, you can be sure you'll have ample room for your clothes and necessities. Add our optional, beveled edge mirror and you'll have the final touch to an already outstanding piece, that will ensure you always look your best before heading off to face the day! 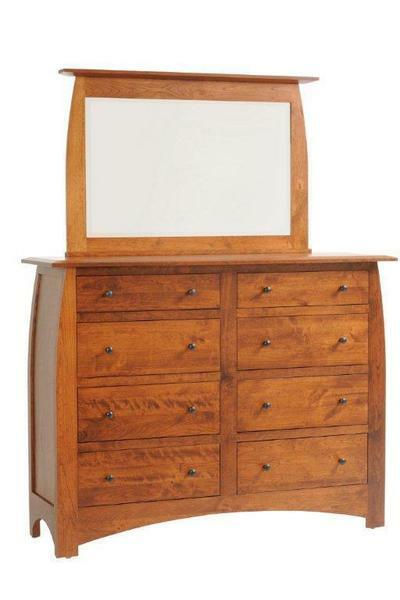 Call today to speak with a furniture specialist about our handcrafted bedroom furniture. We offer stain samples for all of our furniture to ensure that you receive just the right piece that make your unique space!